This test series was intended to evaluate the error detection capability of the IQM System for a variety of clinically relevant delivery errors and compare with results of other verification systems. 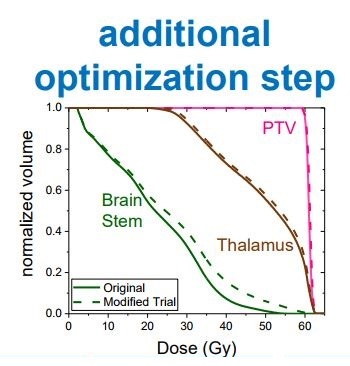 Three clinical IMRT plans were modified: Brain, Prostate, Head & Neck. All errors had a clinical effect: DVH parameters of either the targets or organs at risk changed by a few percentages. The plans were measured each with the IQM. The error detection threshold of the IQM System was set to report deviations of 3%. The modified plans were also verified with an ion chamber based cube phantom. The error threshold was defined as +/- 3%. The modified plans were also verified with a Gamma-Index based analysis using a cylindrical phantom. The acceptance criteria were set to 3%/3 mm>98% (2%/2 mm>95%). The following tables show for how many beams within each of the 9 field plans deviations were detected by each verification method. 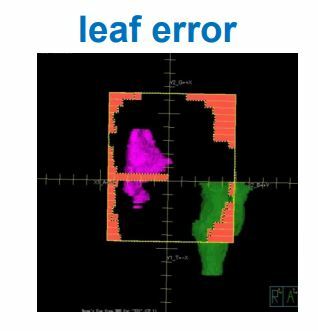 IQM detected 11 of 12 errors, the ion chamber & cube phantom method detected 4 of 12 errors, while the cylindrical phantom with gamma index analysis method detected 8 of 12 errors. The error that was not detected by IQM was also not detected by the other two verification systems. IQM showed the highest error detection rate of all three tested verification systems. During the tests only very limited user interaction was required with the IQM System. The IQM error detection was superior to the other QA procedures.